Buying blood oranges is like buying the most exquisite clothes. They’re rare. They require respect. You wouldn’t don a perfectly cut Dior dress and then stick an old coat over it. So it is with blood oranges, your approach should be clean, restrained, simple. And so it is with this recipe. Blood oranges and Campari is a match made in heaven. Pour 200ml (7fl oz) of water into a saucepan and add the sugar. Place over a medium heat, stirring to help the sugar dissolve. Add the zest and both juices and bring to the boil. Take off the heat and leave to cool. Strain. 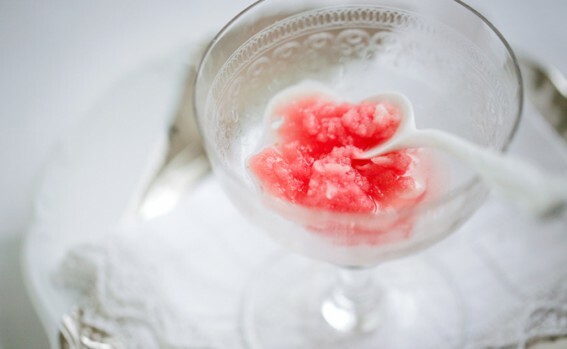 Add the Campari and put the liquid into an ice-cream maker to churn, or pour into a broad shallow freezerproof container and put in the freezer. If you choose the latter method, when the bits round the outside have become firm, mix everything up together again with a fork. Do this three or four times during the freezing process, so that you break up the crystals to ensure a smooth sorbet. If you don't want to keep doing it by hand you can put it in the food processor and whizz briefly, but I can never be bothered with the washing up this entails. If you have used an ice-cream machine, put the sorbet into a container, cover and store in the freezer.